Characters on journeys home or fleeing their bad environments are a staple of independent cinema. In all forms of storytelling, we’re fascinated with the story of the return of the prodigal son or ghosts of a past that won’t go away quietly. We’re always coming home or leaving home, and two films at TIFF this year were about men coming to terms with their dark pasts, while two more were about young women looking to leave their equally dark present situations. The director of two of the best films of 2016, Jeff Nichols, produces “In the Radiant City,” a feature film debut for co-writer/director Rachel Lambert that falls into that “promising but flawed” category we so often see at festivals. Andrew Yurley (Michael Abbott Jr.) has come home for the first time in years. He left town—or, more accurately, was kicked out after being shunned by his family—after he testified against his brother in a murder case that sent him to jail. Now that his brother’s case is coming up again, he’s back in town, but his sister Laura (Marin Ireland) literally can’t even handle the sight of him, vomiting after seeing him in the store in which she works. Laura’s daughter Beth (Madisen Beaty) makes contact with Andrew—although he doesn’t know that she’s his niece—while Andrew’s mother Susan (Celia Weston) needs a lot of assistance due to poor health. What exactly Andrew’s brother did so many years ago is only seen in vague flashbacks, and Lambert is very purposefully vague in terms of allowing the audience to take sides. Did Andrew do the right thing by sending his brother to jail or should we be as furious with him as his sister appears to be? Of course, in situations like this there are often no easy answers, but the lack of narrative clarity to hold onto here isn’t replaced by anything interesting. We’ve too often seen stories like this before and the characters/setting don’t stand out in a way that allows this to resonate as a mood piece. Worst of all, the dialogue starts to sound self-conscious in the final act, particularly in two key meetings in which the writing gets laden with cliché. The performances are good, especially Beaty, and I’m always drawn to films that offer more questions than answers, but every time I tried to put my finger on “In the Radiant City,” it slipped away. From one small town to another, we move to the sparsely-populated home of Katie (Olivia Cooke), the naïve, wide-eyed protagonist of “Katie Says Goodbye.” Wayne Roberts’ vision of a young woman’s journey through Hell—to escape a miserable life that she somehow still greets with a daily smile feels—too often like poverty exploitation, looking down on people who live as truck-stop waitresses or middle-of-nowhere mechanics. I don’t believe this is Roberts’ intention, but by writing a cast of characters who feel clichéd and unbelievable creates the effect in that I never believed a second of “Katie Says Goodbye." Its truly dark edges feel more grimy and exploitative than moving. None of this is the fault of Cooke, who gives her all to a movie that doesn’t give enough in return. She plays Katie, a sweetheart of a waitress who happens to sleep with the truckers who come through the restaurant to make a little extra cash so she can leave this dark corner of the country. Her mother (Mireille Enos) is an awful human being, the kind who steals the rent that Katie gives her to pass along to the landlord, essentially forcing her daughter to prostitute herself more to make up for it. Mary Steenburgen plays Katie’s kind boss, Jim Belushi one of her best clients, and Christopher Abbott co-stars as the mechanic that Katie hopes will ride off into the sunset with her. The world around Katie is so menacing and oppressive that Katie starts to resemble a heroine in a horror movie—we know something bad is going to happen to her and the only question is if she’ll make it out of town alive. Roberts can’t handle the dark places his story goes, and none of the supporting cast works. Even the talented Abbott can’t find the heart of an underwritten character. Cooke is good here, largely because she’s a talented actress but also because only her character feels like more than a plot device. Pete Travis’ “City of Tiny Lights” has a similar “performance is better than the movie” problem, but this one works more overall, partially because it’s not so viciously dark, and the setting offers the filmmakers a chance to tackle a classic genre in a new way. 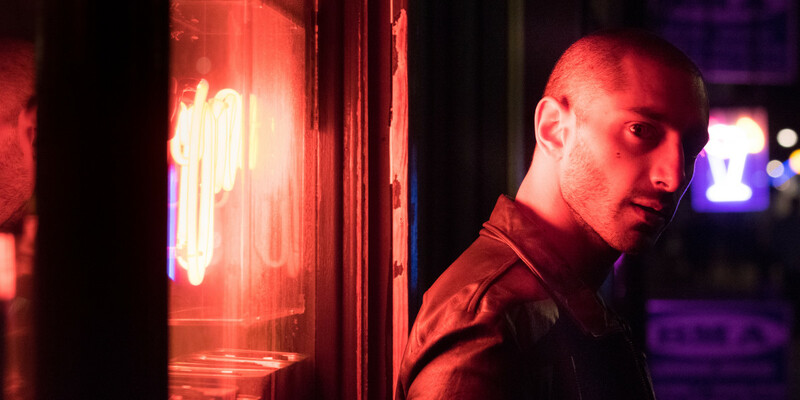 Based on the book by Patrick Neate, who adapted his own work, “City of Tiny Lights” is a multicultural noir, a movie that tackles the new melting pot of London in a unique way, as anchored by a strong performance from the great Riz Ahmed (going for the best year of any actor with “The Night Of,” “Rogue One: A Star Wars Story” and more). The script for “City of Tiny Lights” never quite comes together, but Ahmed keeps it worth watching. He plays Tommy Akhtar, a true noir protagonist, right down to overheated voiceover and Chandler-esque dialogue: “That looks bad, you should go to the hospital for that.” “I can’t. I got a date.” Tommy’s life goes in two directions during “City of Tiny Lights” as a woman from his past (Billie Piper) surfaces, bringing up memories of a key incident in his youth, while he also gets a new case when the femme fatale Melody (Cush Jumbo) walks into his office. Melody’s friend Natasha is missing—can Tommy find her? Don’t all noirs start that simply. The problem is that Tommy’s search for Natasha doesn’t really go anywhere narratively interesting. The flashbacks, which at first felt like a distraction, actually develop into the more interesting half of the movie. The sad truth is that the main mystery of “City of Tiny Lights” doesn’t offer enough in film form. It probably works much better in the book, in which the two halves of the film could feel more completely merged and Neate’s racially-charged story could feel denser. As is, this is another reminder that Ahmed is going to be gigantic, but I wish this particular film had given him a few more ways to prove that. Finally, for this dispatch, I just want to chime in with agreement with Alex Huls’ positive assessment of Adam Leon’s wonderful romantic comedy “Tramps,” possibly the most purely enjoyable film of TIFF 2016, non-musical category. Everyone loves that feeling of watching a movie with such engaging leads that one knows almost instantly that they are watching future stars. There’s no justice in the movie system if the phones of the agents of stars Callum Turner and Grace Van Patten aren’t ringing off the hook after people see their performances here—they’re funny, genuine and so entertaining. Turner’s smile is the kind of thing movie stars are made of and Van Patten has a perfect balance of comic timing and street smarts. I also love how much Leon’s film is in love with New York (the opening titles say “Made in New York” for a reason). From the long-distance shots of city streets to busy storefronts to train stations—this is a great New York Movie. If there are a lot of movies about people trying to leave places like in “Katie Says Goodbye” and “In the Radiant City,” there aren’t many that feel like love letters to modern cities as much as Leon’s film is to New York. It’s a city where two crazy kids can randomly cross paths on a crime caper and romance can blossom. In New York, anything is possible.